Are you looking for a professional and experienced all purpose hauling company in Clearwater Florida? Then look no further, we have the most experienced hauling specialists in Clearwater FL! We can clean up and haul away anything and everything. No job is too big or too small! Whether it be clean outs, cleanups, hauling, yard debris, removal of household items or removal of office equipment, our team of experienced hauling professionals will remove and dismantle any and all unwanted items. You name it-we can do it. ​How do we do it? We do it with whatever equipment is relevant to each job. For example, we have Dump Trailers and Roll Off Boxes, also know as dumpsters. We offer multiple trailer sizes ranging from 10 cubic yards to 28 cubic yards. We also offer Roll Off Boxes in 10, 12, and 15 cubic yard sizes. It is not necessary for you to put your day on hold to stay at home for delivery. Our trailers and roll off boxes will fit in a standard size driveway. We can merely drop the trailer off at your home or business and if you are a do it yourself person, you can fill it up yourself and call us when you are ready for us to haul it away. We do ask that you keep the load level and be careful not to let it spill over the top. On the other hand, you might want to choose the option of letting our professionals load for you. It's your decision. All trailers are built to handle the job and are operated by our crew with efficiency and safety in mind. Call now for a free no obligation quote. APARTMENT CLEAN OUTS: Whether you are moving in or moving out, there is always something left behind that you just don't want to deal with. APPLIANCES: Are you getting a new refrigerator, freezer, washer and/or dryer, dishwasher, stove, microwave or maybe just a toaster oven? We can haul these used items away to make room for your new purchases. ATTIC CLEAN OUTS: Attics are often forgotten rooms. Sometimes we tend to forget about those items of memorabilia stashed away (often for years)...so, while you are in the process of Spring Cleaning, why not tackle those long forsaken items and allow our hauling company in Clearwater FL to disencumber you from holding on to them when chances are you really would feel better having freed yourself of them. Our team members are not afraid to fight off the cobwebs. BACK AND FRONT YARD: Dying bushes and fallen tree limbs can be unsightly and sometimes even a hazard. Let us tidy up your yard and haul away all the unwanted debris. BASEMENT JUNK REMOVAL: Just like attics...basements often become catchalls for your family home. Old furniture, toys and various other articles can pile up and before you know it, you're scratching your head to figure out a way to get rid of all that clutter. That's when you need to call us and we will dispatch our professionals to jump right in and you can say bye bye to your woes. BATHROOM REMODELING DEBRIS: MESSY, MESSY and even MESSIER! Wall board, plaster, nails, screws, tile. toilets, sinks, showers, tubs, cabinets, electrical parts and more can be a heavy weight (physically and emotionally). Snap your fingers and we will appear like magic and whisk it all away. BRICK PAVERS: We can remove your unwanted pavers and find ways to recycle them in an effort to keep our earth "green". CARPETS: Removing tacked down carpeting is a tedious job. We will not only pull up the worn down eyesore for you but we will take out the padding and tack board as well. Have you ever tried to roll up a carpet for disposal ? Not such an easy task. It can be heavier than you imagine. Then, where do you put it ? What a headache ! No worries...our team members will save you the trouble. CARPORT CLUTTER CLEANING: You have probably seen some carports where miscellaneous items have been strewn about willy nilly...maybe old , broken toys, garden tools, hoses, and more. If that rings a bell with you and your carport needs some attention, call our company at 727-581-9041 for a sprucing up. 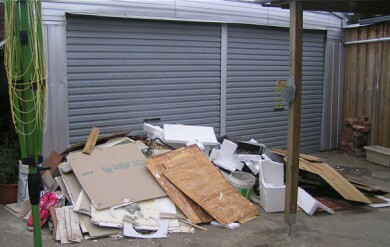 CLUTTER REMOVAL: Clutter anywhere and any place is a nuisance and often a safety concern. So let us help you do away with the unnecessary mess. We'll remove it from your eyesight and make you feel better and safer. ​COMMERCIAL PROPERTY CLEAN OUT: Commercial clean outs run the gamut from cleaning out an office to getting rid of furniture, tearing down cubicles. It includes major business equipment, home remodels, foreclosures, estate homes...even multiple family units, such as apartment buildings, vacant lots and warehouses. We have experience in removing all types of junk material. Whatever doesn't fall in the category of junk, we can turn over for recycling. Let us put a big smile on your face as we relieve you of all the hassles. CONCRETE/ASPHALT REMOVAL: Removing heavy construction materials like concrete or asphalt can pose a big problem for Do-It-Yourselfers. Don't take a chance on putting yourself in harm's way. Rather, hire our capable workers to haul the unwanted material away for you. We have roll off dumpsters that can do the job. No need to keep it laying around causing a blight on your otherwise impeccable property. We are not a BROKER....we supply our own hauling vehicles. COUCHES/SOFAS: We will dispose of these items, as well as any other furniture you no longer need. Sometimes we can recycle furniture and donate to a worthy organization. DEBRIS REMOVAL: Any and all debris, including tree branches and twigs, unsightly litter and more can be easily swooped up and taken away for proper disposal in our trailers. DECKS REMOVED: Following years of use, maybe your old deck is looking pretty shaky. That could cause a concern for your safety and that of your family. The boards tend to give way after ages of exposure to the elements such as the sun and the rain. After years of wear and tear, the wood looks soft and the surface is splintered. Warping is evident. It's time to knock it down! We can tear it down and save you the time and effort. We then, will haul it away for your convenience. DRIVEWAYS REMOVED: Why not hire our guys to pull up that cracked and unsightly concrete/asphalt driveway. They have the skills and muscle and tools to do the job. Then, as we mentioned earlier, we'll load it in our hauling vehicle and drive it away. DRYWALL/SHEETROCK HAUL AWAY: Just another aspect to our services meshed with construction and remodel of any property, residential or commercial. ESTATE CLEAN OUTS: Sometimes these projects can be intimidating because time might be of the essence, due to sudden death of a home owner or health care concerns. Often furniture of great magnitude must be dealt with quickly. At times there is an issue of a buildup of uncleanliness to attend to. We can dispatch help in a swift manner to make the process go easier and faster. Our helpers can clean up the unwanted mess, as well as pack up the furnishings and haul them away to the dump, if needed, or if they can be recycled and donated. FENCES: Did a nasty storm blow down your fence? Call our company to send our experienced pros to tear it down and haul it away. We will even clean up the remnants left. FORECLOSURES CLEANUP: More often than not, the folks who have been forced into foreclosure of their homes, figure they have nothing to lose if they just abandon the property, leaving belongings and trash behind. Even on occasion, cabinets are torn out, graffiti and damage are done to the walls and fixtures and sometime worse. Needless to say, banks and mortgage holders have to hire experienced and competent clean up crews to remedy the mess and then have it hauled away. Our company has the finest team available for the job and have come to the aid of those masses of lenders that have been left "holding the bag". We have satisfied those customers across the board and left them ready to engage our services whenever the need arises. From top to bottom, inside and out, we get the job done and done well! FURNITURE: Whether old and dilapidated or in usable condition, take those unwanted sofas, chairs, beds, tables, tvs, lamps, desks, dressers, chests of drawers and anything else you may be trying to get rid of and put them in our capable hands. Just putting them on the curb blocks the view of the beauty of your home and property. GARBAGE REMOVAL: This is such a generalized description. Garbage has many aspects...old furniture, tree trunks, tree limbs and branches, litter on the street, and just plain trash that goes in the garbage containers. Our brave professionals can handle every bit of it, throw it in one of our many trailers, drive it away and "tada", you'll never lay eyes on any of it again. GARAGE CLEAN OUT: Another overwhelming chore! Bits and pieces of miscellaneous small and even large items stored in disarray on the shelves. Old dried up paint in messy cans, screws and nails and various rusty tools thrown in boxes waiting to be sorted but never happens. Wouldn't it be nice to have someone else deal with all that clutter while you attend to other important things OR, better yet, just sit back and relax while our crew gathers everything and takes it for a ride to it's proper destination. HOARDER JUNK REMOVAL: Another burdensome task! Probably one of the most unpleasant clean ups to encounter! Still, it's most necessary for health and safety reasons. Have you ever witnessed the sad state of a home that has fallen under the spell of a hoarder? An habitual hoarder is out of control and sooner than later, so is the house. Both the residents and the surrounding neighborhood become exposed to rodent and insect infestation, not to mention fire outbreaks. The overly crowded state of the home can make it difficult, if not impossible, to get out of the house safely. Our clean up guys come prepared with gloves, trash bags, boxes and more. They will organize a plan and put it into action, after which they have their trailers lined up, ready to load and drive away. HOTEL RENOVATION CLEAN UPS: Yes, that's right, we can even handle picking up and hauling any materials amassed on the hotel site while the renovation is taking place.